Our new SteadiCam prompter is a fully professional unit. It’s not powered by Bluetooth or WiFi which are often unreliable and don’t have the range that SteadiCam operators require. Our unit comes with a professional Paralinx Transmitter Receiver which can control the prompter from 300 feet away. Fully professional lightweight camera monitor monitor with image flip, HDNI, HDSDI, Component, VGA and composite inputs. 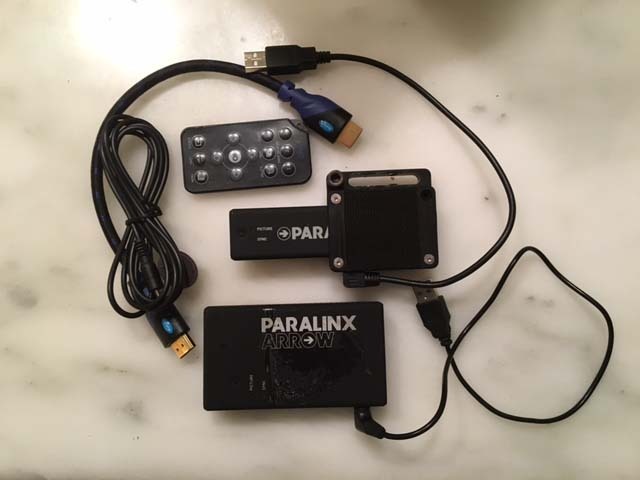 Professional Paralinx Wireless Transmitter. Game of Thrones, The Revenant, Mad Max Fury Road, It’s Always Sunny in Philadelphia, The Big Short, The Martian, Creed, Ninja Turtles, and sooooo may others. Our professional operators know that professional SteadiCam operators want a bright, lightweight monitor and a reliable wireless system which allows the camera operator to roam at will and not fear loss of teleprompter signal.